On May 20, 1970, the Pentecostal Congregation of 25 families purchased the CO-OP Feed Mill on Charles Street, E. and began a twelve-month undertaking to turn it into a Church. Volunteer labour included cleaning removal of wooden floors, raising the floor level by 18 inches before pouring cement. The floor was later covered with carpet. Size of building is 36x80 feet. It has a side entrance from a spacious parking lot. The on foot thick walls were drilled to install stained glass windows. The church is heated with a gas furnace. A steeple topped with a cross adorns the peak. The pews and pulpit came from the Damascus United Church which had been closed about that time. 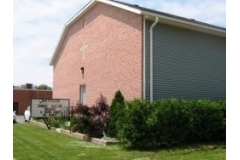 The congregation moved into their new church in Feb. 1971. Sunday Services 10:30am & 7:00pm Early Morning Prayer: Saturday 8:00pm-9:00pm Arthur Pentecostal Assembly Kids Club: Wednesdays 7:00-8:15pm The Early Years Drop In: Thursday Mornings Senior Youth Group (Grades 9-12): Thursdays 7:00-9:00pm Men's Prayer.